grey it's silver! !Not too happy with that but that's all I had Computer generated the sentiment and stuck it all on and must admit with all the bits done it took minutes to do.Think I might even do some for Chrisrmas -those that I don't post! though would use something different than silver for the card. Well that's me but before I go just like to a thank you to all for the comments and a special thank you to Viv for sharing -what a generous bunch you are! Lovely card for Christmas, definitely a bauble! It certainly does look like a bauble! A beautiful card - very inventive with the bangle! How clever to use the bangle, what a lovely idea! Love your ingenius bauble, Jenni! Such a great idea and super Christmas card! Very pretty. Love the simplicity. Clever , it's a pretty bauble! Your card is very creative and wonderful! Jenni, I think this is stunning! I love how the circle-theme plays throughout…the main ornament, the twine around it, the circular sentiment panel AND the buttons. Wonderful design and perfectly executed. Wonderful idea to wrap the bangle with ribbon! 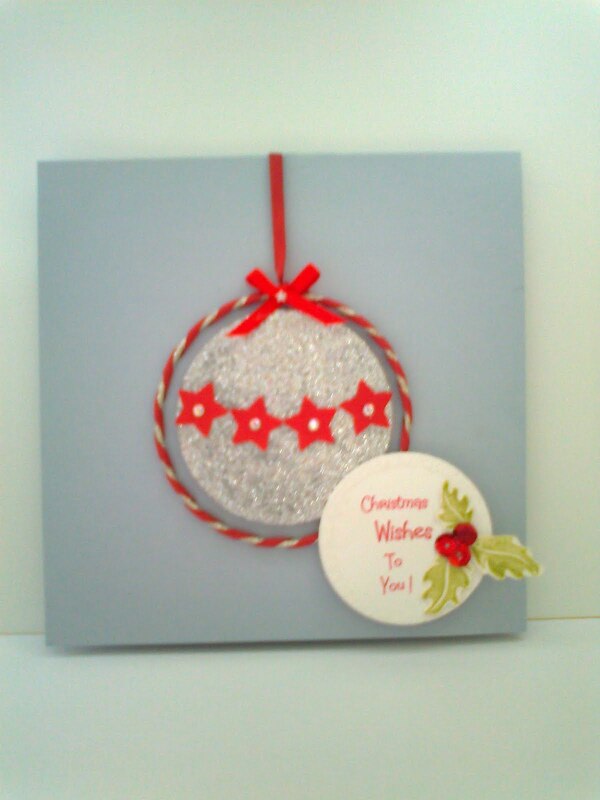 Great Christmas card and a gorgous bauble. Lovely bauble, I like the use of the bangle.